Ninjutsu or ninpo is the modern school of martial arts based on ancient traditions. It is the art of the expertise tactical area of the mountainous regions of Japan esoteric study as of Koga and Iga. The immigrants of millions in number coming from Korea and China in the 6th-7th centuries settled in these rocky regions. They have brought to the existing Japanese culture new trends and breath, in particular related to religion and esoteric study. 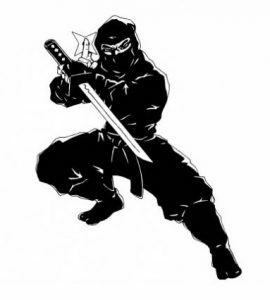 Ninjutsu includes and consolidates various techniques to perceive the danger in every possible occasion, define the close quarter combat tactics as well as the technique of espionage. Ninjutsu is the unique kind of martial arts which equilibrated all the features of nature. Such unique features as force, speed, precise time detection and application of the least efforts to achieve the optimal effect are attributed to this martial arts. Schools of Ninjutsu arose back in the past along with the class of samurais, though these schools have little to compare with the Ninjutsu. The Ninjutsu schools have no common roots with samurais, either in the technique of making wars or their philosophy. Samurai people highly appreciate Bushido, the special Japanese code of conduct and a life style for samurai close to chivalry. This code is based upon the old samurai code to stress loyalty, mastery of martial arts and honor to death. They set their ideas much higher than other values when the Ninja receive confession of the opposite philosophy. With the purpose to achieve the goals, the warriors in the shadow used any potential and impossible means. The warriors have never been restricted in activity since they had to survive at all hazards, thus, horning the skills of perseverance. The ninpo practice tells that it is not feasible to get absolute safety for a human being. The world around us is not safe. Any motion and any action disrupt the harmony in the world evoking the resistance which breaks the equilibrium as stronger the resistance is. The life circle is similar to the natural circle. One should realize why and how the harmony is broken and to learn to avoid all the aftergrowth or minimize adverse effects. The ninpo terms stand for patience, tolerance and stealth. The principles of the mental purity described in the encyclopedia of Ninjutsu (Basen Shukan) do not recognize the hatred, striving to get power and gratification since these things blur senses and racket the harmony with the environment. The feeling of love to the family and society, the responsiveness for the formal school of fate compel the Ninja to the fight. When talking about Ninja, the legendary Ninja-kunoichi should be mentioned as ever. These Ninja-women would have been trained as thouroughly as men. The study for Ninja-women was accentuated to the tactical and psychological training with the aim to manipulate enemies to win. The Ninjutsu weapons they use are numerous, from ancient swords, naginata and yari to the special concealed weapon, floating devices and a lot more. Most Ninja were specialized in what they family did instead of mastering all techniques. Considering Iga and Koga regions today we face families who master some basic skills of Ninja specialized in special weapon studying the strategy. The training of Ninjutsu consists of three stages that jointly make the system of resistance to the whole world of danger. ⇒Confluence with the world; subjection to five elements of the earth, water, fire, air and vacuous space. The special training was provided for this special purpose including the covered movement, use of the environment, inland navigation, concealing and hiding, and many more. When merging with any of the five elements, the warrior gets invulnerable for the opponent. ⇒Taijutsu is the man-to-man fighting with the rivaled; Bujinkan Taijitsu uses body movement and various positioning to defeat the opponent. All techniques in Taijutsu are devoted to get the opponent off balance while keeping it on your own. Some techniques involve slashing and stabbing. Others us the staff as a pole vault. ⇒Ninpo mikkyo is the technique to apply to the changed state of the sense to mobilize the inner resources.